To be able to develop present floating bridge technology, it is crucial to have detailed knowledge about the performance of existing floating bridges. An extensive measurement program on the Bergsøysund Bridge is therefore a part of this research project. The measurement system includes recording of the environmental excitation and the response of the bridge. 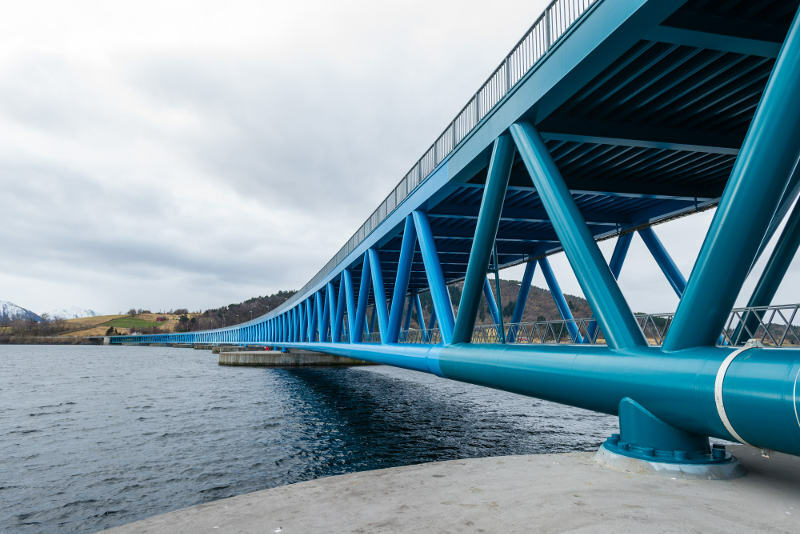 The Bergsøysund Bridge is one of two end-supported floating bridges in the world, and is considered a very interesting case study. By comparing the measurements to numerical predictions based on state of the art methodology, the accuracy and uncertainties of the methods will be studied. The overall objective is to contribute to floating bridge technology, such that an economic and reliable design of future strait crossings can be achieved. How does a floating bridge behave, and what environmental parameters affect the behavior? How well do the current prediction methods estimate this behaviour? How big are the uncertainties? What is the cause of the uncertainties? Giske, Finn-Idar Grøtta; Kvåle, Knut Andreas; Leira, Bernt Johan; Øiseth, Ole. (2018) Long-term extreme response analysis of a long-span pontoon bridge. Marine Structures. vol. 58. Kvåle, Knut Andreas; Øiseth, Ole. (2017) Characterization of the wave field around an existing end-supported pontoon bridge from simulated data. International Conference on Earthquake engineering and Structural Dynamics ; Reykjavik. 2017-06-12 - 2017-06-14. Kvåle, Knut Andreas; Øiseth, Ole. (2017) Structural monitoring of an end-supported pontoon bridge. Marine Structures. vol. 52. Kvåle, Knut Andreas; Øiseth, Ole; Rønnquist, Anders. (2017) Covariance-driven Stochastic Subspace Identification of an End-supported Pontoon Bridge Under Varying Environmental Conditions. International Modal Analysis Conference ; Garden Grove, California. 2017-01-30 - 2017-02-02. Kvåle, Knut Andreas; Øiseth, Ole; Rønnquist, Anders. (2017) Operational modal analysis of an end-supported pontoon bridge. Engineering structures. vol. 148. Kvåle, Knut Andreas; Øiseth, Ole; Rønnquist, Anders; Remseth, Svein N. (2017) Simulation and monitoring of floating bridge behaviour. International Conference on Earthquake engineering and Structural Dynamics ; Reykjavik. 2017-06-12 - 2017-06-14. Nord, Torodd Skjerve; Kvåle, Knut Andreas; Petersen, Øyvind Wiig; Bjerkås, Morten; Lourens, Eliz-Mari. (2017) Operational modal analysis on a lighthouse structure subjected to ice actions. Procedia Engineering. vol. 199. Kvåle, Knut Andreas; Sigbjørnsson, Ragnar; Øiseth, Ole. (2016) Modelling the stochastic dynamic behaviour of a pontoon bridge: A case study. Computers & structures. vol. 165. Kvåle, Knut Andreas; Øiseth, Ole; Rønnquist, Nils Erik Anders; Sigbjörnsson, Ragnar. 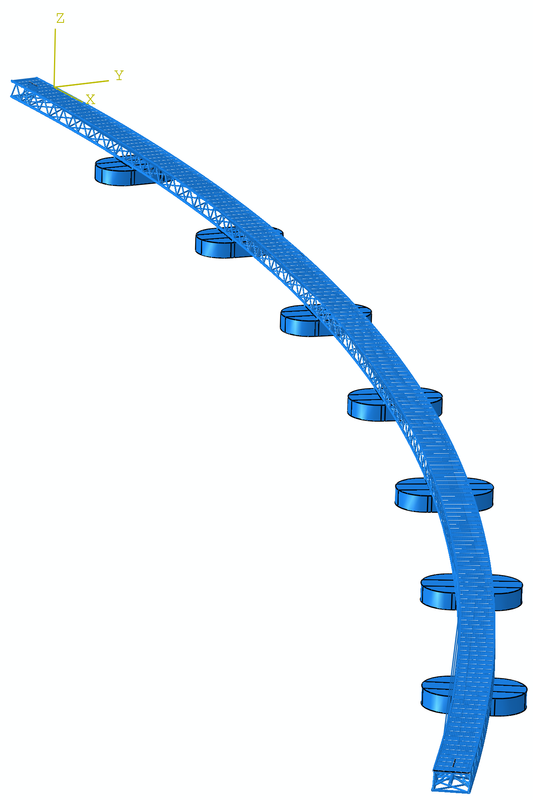 (2015) Modal Analysis of a Floating Bridge Without Side-Mooring. Dynamics of Civil Structures, Volume 2: Proceedings of the 33rd IMAC, A Conference and Exposition on Structural Dynamics, 2015.